The nagioss 1.2 server (must run on the Nagios server) Linux and FreeBSD binaries (newest release version 1.2 june 17th 2005, completely multithreading for better support with large quantity of viewers). Nagios is an opensource monitoring and reporting framework. We utilize Nagios to monitor the systems of our Support on Demand customers; if the infrastructure allows us. Nagios is a very flexible, easy to configure and free monitoring suite. Nagios has been developed by Ethan Galstad and can be downloaded at: www.nagios.org. Nagios has one small disadvantage and that is the web based interface for their monitor. Due to the used HTML technology the status is obtained by a 'pull' action from the web browser. At default the Nagios status page gets refreshed every 90 seconds. We wanted to see instant response after a monitor had finished monitoring. Nagios uses a status.log file that gets updated/generated everytime when a monitor has done it's work and after every 15 seconds. We developed a server, (in Unix terms a daemon), that monitors the status of this file. Once it has been changed the file is send to all the clients connected to the server. This way you know the new status almost instantly. A graphical frontend written in C++ with the commercial QT library visualizes this status. We run Speedview and Nagios to monitor the status of all our customers' systems so we can provide pro-active support to our customers. Our Speedview runs on a Mini Mac with a 28" Dell flat screen. We also developed Unix agents (also Mac OS X) to monitor Unix systemes and collect performance and capacity data. If you would like to obtain an agent (based on inetd) please feel free to contact us by email. -Application icon that changes colour according to the nagios state. Except on Mac OS X, we found a memory leak in Aqua's setIcon. -Filtering any ghost messages from Nagios to avoid fake error messages. -Support for Mac OS X Tiger and Panther. Nagios SpeedView OK state (Win32). 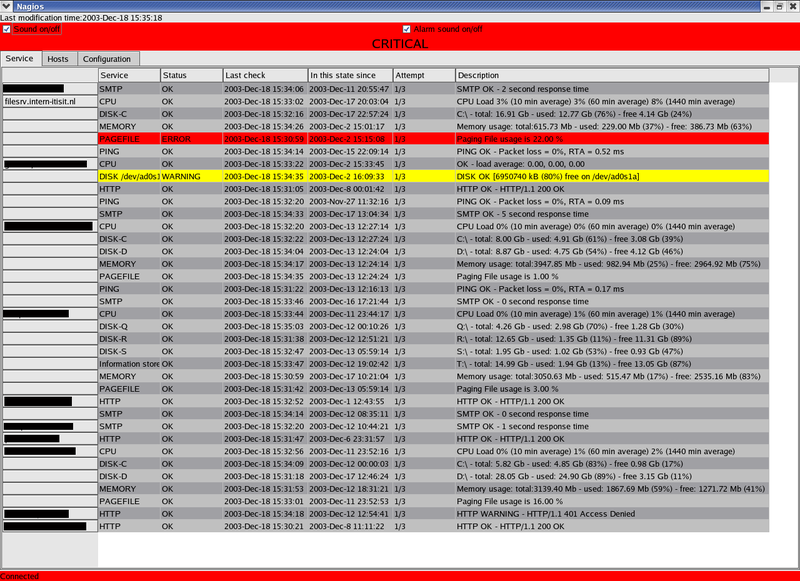 Nagios SpeedView host view (Linux). -The Nagios SpeedView monitor client unlike some commercial versions, will automatically try to reconnect to the server when the connection has been disrupted; Forinstance when the monitor server was down for maintenance. -Two views, Host view of the Service view, similar to the Nagios web client. -Filtering option. Unlike the browser you can easily filter the content visible by using regular experessions. When you'd forinstance only want to see the servers in the domain itisit.nl. Than you simply type itisit.nl in the filter at the Configuration tab. -Cross platform, due to the QT library the application is cross platform and is known to compile and run on Linux, FreeBSD, Mac OS X 10.3 and Win32. We only issue the Linux and the Win32 version for downloads. On request we will be able to build for other Unix platforms. -Accoustic warning for warning and critical states. Nagios SpeedView plays a warning.wav or error.wav depending on the state. Since Nagios refreshes it's status file so frequently, the sound will be played everytime. So we designed it so that you can either switch of the Alarm sound for the warning or all the sound. IT=it is a strong supporter of OpenSource technologies. However, the nagioss (server on Unix) uses IT=it's and phonax.com's socket libraries/classes that give us an advantage in the area of software development over our bigger compatitors. The Nagios SpeedView monitor is developed using the QT cross-platform GUI library. Since most people do not have a licensed QT version, people wouldn't be able to compile the program in a non Evaluation Version anyway. So we decided to also offer the Nagios SpeedView monitor as binary only. Yes it is, for our Support on Demand customers and everyone who wants to download it. The Nagios SpeedView exists of two components: the nagioss daemon and the actual Nagios SpeedView monitor. The nagioss daemon is available for Linux (compiled on RH9 with glibc2.3.2) and FreeBSD4 and FreeBSD5. 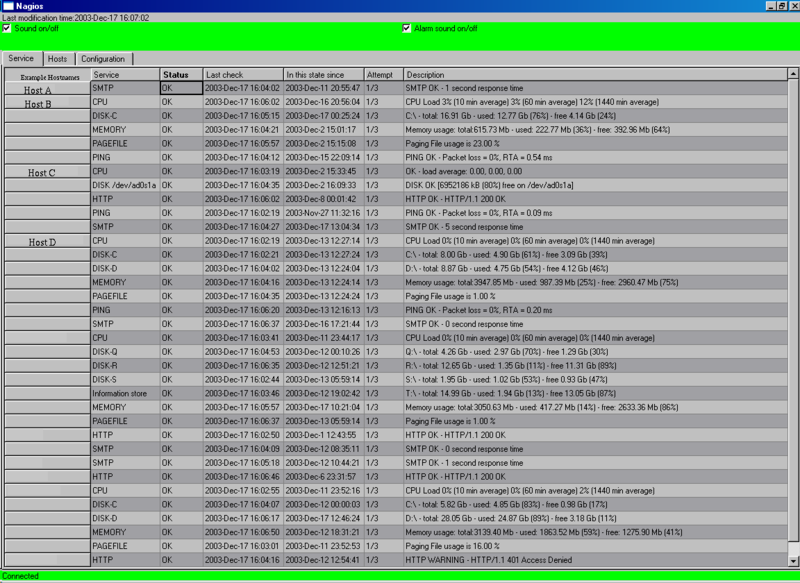 The Nagios SpeedView monitor is available on Linux (glibc2.3.2 and QT >=3.1) and Win32. Configuring nagioss daemon is quiet simple, place the correct binary in a preferred location on the Nagios server(s). The nagioss daemon has two optional arguments: -f and -p. The -f option is used to point the nagioss daemon to another file than the default /var/spool/nagios/status.log file. The -p option starts the TCP listener on a port other than the default 7800.
nagioss -f /var/nagios/status.log -p 1200 will send the file /var/nagios/status.log to every client connecting to port 1200. The daemon wil fork itself into the background, so there's no need for an & after the command. Testing is simple, just telnet to the server and port on which the nagioss has been started. Almost instantly you will see the file flash by. If the file can't be found or accessed due to rights restrictions you will see: FILE ERROR. Configuring the Nagios Speedview, is even more simple. Unzip the file, start Nagios.exe (on Win32) or Nagios (on Linux). You will notice that the status bar says Connection denied or Host not found. This due to the fact that the first time the Nagios monitor will start to connect to localhost port 7800. To alter this, click on the Configuration tab. In the host field you type the hostname of your nagioss sever. In the port field you type the port number on which your nagioss daemon is listening. Optionally you can fill out a filter to match certain criteria. The filter is actually a regular expression matched to each line of the Nagios status file. When you are done click save, then the client will connect to the new hostname and port.